The case that we’re all just highly organized lumps of space candy keeps getting better. For the first time, scientists have created ribose—the key sugar underlying RNA—in laboratory conditions simulating the cold, radiation-blasted vacuum of outer space. The early origins of life are one of the murkiest chapters in our planet’s history. 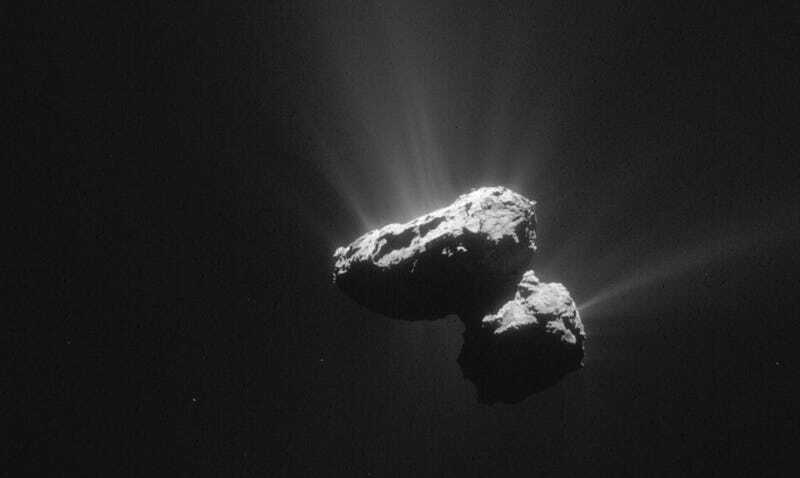 One major point of debate is whether life’s building blocks—things like amino acids, lipids, and sugars—formed spontaneously here on Earth or rained down on our planet via comets and asteroids. With no fossil records to guide us, scientists use experiments to simulate the formation of our goopy, pre-biotic heritage. These experiments trace all the way back to the 1950s, when Stanley Miller and Harold Urey famously demonstrated that several organic compounds could form spontaneously in conditions simulating our planet’s early atmosphere. Fast forward sixty years, and our ability to mimic both the primordial Earth and outer space environments has grown far more sophisticated. In the latest experiment, which appears in Science today, a team of chemists led by Cornelia Meinert of the University of Nice Sophia Antipolis recreated the ices found abundantly on comets and in interstellar clouds to see if complex organic molecules could form. The researchers cooled water, ammonia, and methanol to -195 degrees Celsius in a vacuum, then subjected their ice crystals to UV light to simulate the radiation output of a young star. All in all, the team was able to produce 55 organic molecules, most notably ribose, a critical sugar found in the RNA molecules that transmit DNA’s genetic instructions. RNA possesses the unique ability to pass along genetic information and self-replicate, leading many researchers to suspect that the earliest forms of life on Earth were in fact RNA-based. The possibility that RNA molecules, or at least, many of their ingredients, could have emerged off-Earth has never looked better. Today, experiments like this one are complemented by detailed analyses of comets and cosmic dust clouds. Last year, the European Space Agency announced that it had discovered a slew of simple organic molecules on Rosetta’s comet. And the evidence has been mounting for years that amino acids, the building blocks of proteins, can form spontaneously in high-radiation interstellar environments. For these reasons and more, my colleague Adam Clark Estes would like to offer a solution to the Fermi Paradox: the aliens are all just cotton candy.